Wondering why those new eye creams you keep trying out after hearing rave reviews, are still having no real effects for you? You still wake to those unsightly crow’s feet staring you in the face, and sometimes It can seem like no matter how hard you try, no matter how much you spend on that top of the line- new promising eye cream, that nothing will stop them from protruding off your face, even just a little bit! There’s a reason those eye creams aren’t working for you and it actually has really nothing to do with the eye cream! Sure there are some innovative and great new ingredients out there, but if you’re not doing this one thing, you will get no results from that eye cream, whether it’s a cheap $30 drugstore find or you’ve splurged on that $150 Luxury department store eye cream! See the reason those eye creams aren’t working as efficiently, is because any cream that just sits on top of the skin but isn’t massaged into it, isn’t going to do it much good. And It’s not just for eye cream, this goes for your regular face moisturizer too! If you want any product to work more effectively on skin, it needs to be rubbed in, to penetrate the deeper layers of the skin where new skill cells are created. The skin is thick and strong and made to resist the outside world, so a simple cream sitting on top of it won’t do you much good, other than making dry skin feel much more hydrated and moisturized. If you want those expensive anti-aging ingredients to minimize some fine lines and wrinkles, you need to spend some time rubbing the product in. Messaging product into the skin softly for a minute or two can make a dramatic and very noticeable difference, even right away. I know it’s hard when you’re washing up in the bathroom and getting ready for bed, to spend any more time on the already extensively long laundry list of products to apply to the face and skin before bedtime, but doing this simple trick can pay off in a big way. Also, be sure not to rub product in on the upper eyelids. Pat gently. Upper eyelid skin is too sensitive and it’s best to lightly apply with the pad of the finger in a dotting motion. There are a few other things you can also do to boost the performance of your products and enhance your eye massage. 1. Opening up the pores is a great way to help the skin open up and take in more ingredients from your topical skin care creams. Wash and rinse face with warm -hot water. Pat Dry, and apply your creams. *Don’t forget to massage it in! By opening up the pores, you’re allowing your skin to also be more open to gobbling up that skin cream and its powerful anti-aging ingredients, which in turn will leave skin looking more youthful, as well as firmer, smoother, and more glowing too! Tip: Use a facial steamer or sit in a sauna a couple times a week before bedtime, to also help open the pores more effectively. 2. Exfoliate Your Face. This step helps remove the dead layer of skin sitting on the surface, so your product can work more deeply and efficiently on the healthy, newer layer of skin underneath. Tip: Be sure to exfoliate only one or twice a week as exfolliating two often can do more harm to the skin than good! 3. Take your massage step a bit further by using an Ionic Heated Eye Wand Massager. This eye massager not only feel amazing and super relaxing, but the perfect frequency sonic vibration really smoothes out the skin and leaves skin feeling softer -yet firmer and more elastic too. Skin is also left with a nice glow. Simply move the wand around the skin underneath the eye, in slow, gentle circles, back and forth, to help product absorb into the skin. By using this awesome massage vibration, the anti-aging ingredients in your eye cream will better be able to penetrate deep into the skin, making the eye cream much more effective, and wrinkles and crows feet will soon be able to smooth out and appear less deep, and less noticeable. It also works amazingly for getting rid of bags and puffiness immediately too! Plus it’s also a nice little refresher for waking tired skin, and works great either in the AM or PM! The heated function of this eye massager also helps open up the pores to help ingredients from your eye cream work more effectively. The Iontophoresis used in this massage wand helps skin care cream penetrate better into the skin basal layer, activating skin cells and minimizing the appearance of fine lines and wrinkles. The massager can be used three to four times a week and used until you feel your skin cream is completely absorbed (about a minute or two). You will notice how much better your product is absorbed into the skin immediately when using this handy beauty tool! 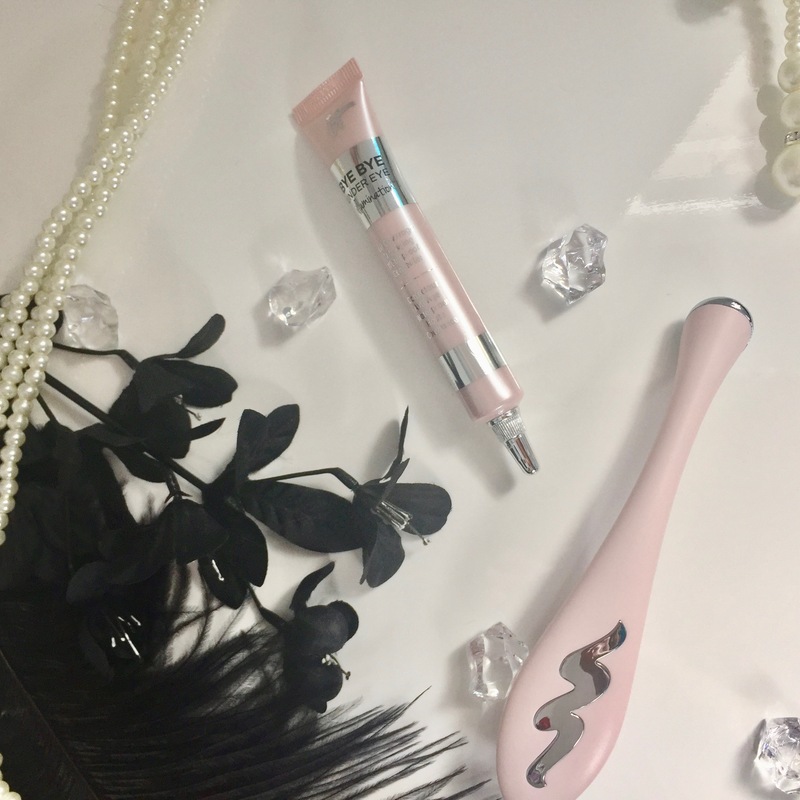 Skin feels lighter and less greasy too when using the eye wand! When it comes to skincare, sometimes the most effective ways to get younger, more youthful looking skin, aren’t always that obvious. While I’ve read the directions on many skin care creams in the past, many different times, that outright say to massage the product directly into the skin, I really just thought that was a more luxurious way for saying “slather this stuff on your face.” But turns out, there is actually a reason skincare brands tell you that, and that’s because your skin cream and eye cream will be much more effective if you actually take the time out of your day to correctly massage it into the skin, and make sure it is fully absorbed. Hopefully armed with this knowledge and these other tips for helping your skin open up to receive the ingredients from your skincare creams, you will notice the lines slowly disappear, and a more youthful, healthy glow and radiance that soon takes over instead! Speaking of eye creams, what are some of your favorites? Have you found useful ways to make them more effective? Leave me a comment, I love hearing from you! You can also read this blog post Here on Consumer Health Digest. (Why Your Eye Cream Isn’t Working + The #1 Tip That will Bring You Dramatic Results Instantly) This Revlon product does sound great, but I am curious if you personally have tried any of the Avon products before? I have been using their Anew eye cream and other Anew products and love them. I would love you to try them out and right a review on what you think about them then. I am a new representative with Avon just recently. Here is my link if you decide to try them for yourself.